Ed Ulbrich is the Executive Vice President for Production at a company called Digital Domain, which specializes in designing and creating effects for media. He oversaw the creation of the digital special effects in Titanic, What Dreams May Come, Fight Club, Zodiac, Adaptation and other feature films, as well as in hundreds of music videos and commercials. This TED 2009 Conference talk exemplifies all three of the letters in TED: "T" for Technology, and "E" for Entertainment, and "D" for Design. Even if you haven't yet seen the movie Benjamin Button, about a man who ages in reverse, from old to young, you will enjoy seeing the amazing levels of technology that went into producing a lifelike but aged replica of Brad Pitt. If the video hangs for any reason, here is a link to a high-resolution .mp4 version (you will need an application like QuickTime, RealPlayer, or Windows Media Player to watch it). This will be a long post. It did not start out that way, but as I gathered more and more material, I came to see that what is going on, and what has gone on, in the Diocese of Northern Michigan encapsulates for me, at any rate, much of what I view as the false directions and innovations that were introduced with the revisions to the Book of Common Prayer in 1979. So much has been written directly on that topic that it is helpful to see the matter anew, in the fresh light presented by a real-life situation on the ground, in an Episcopal Diocese. So please bear with me, and be patient 'til the end, far below. One of the largest threads ever at StandFirm (337 comments) had to do with the nomination of a single "candidate" for the post of "Bishop/Ministry Developer" of the Diocese of Northern Michigan. Now that the candidate has been declared officially "elected", and the process of gathering the required consents from the diocesan standing committees and the bishops with jurisdiction has begun, we have the blogworld generally taking notice---and the results are, to say the least, fascinating. I cannot think of another single event that has united, on the same side of the issue, StandFirm, the Mad Priest, Christopher Johnson and David Virtue. Joining them as well are Dean Kevin Martin at Covenant, Father George Conger at Religious Intelligence, and James Kushiner at Touchstone. The ties appear to have continued after that. I have had only a short time to put some pieces together from searching the Web, and I hope that others more knowledgeable about the facts will be able to fill in the gaps. Throughout the Anglican Church, from New Zealand to North Dakota, congregations are transforming themselves into communities of mission and ministry without full-time ordained leadership. This phenomenon has intrigued many, offended some and mystified others. This course will introduce participants to new thoughts and actions based on the principles of the Baptismal Covenant, and to ways in which a congregation can take full responsibility for its own mission and ministry, including the gifts of all baptized persons, not just the ordained. Resources and tools for moving forward are included as part of the course. The Diocesan Council and Leaders from around the diocese met November 14-15 in Marquette. They reviewed the year 2003 and began the process of developing a long-range strategic plan that would assist them in allocating time, talent and resources to support the gifts, needs and opportunities existing within their congregations. . . . Some of the significant successes that the group named from the past year included the progress in creating LifeCycles; new Covenant Groups forming, and Ministry Support Team commissionings; . . . leadership nationally and internationally in mutual ministry and church reform; cohesiveness in the face of controversy at General Convention; and a good deal of outreach and justice work around the diocese; among many other things listed. [The facilitator] then asked the participants to name the assumptions that we need to recognize as we plan our goals. They include aspects of our situation that we do not have control over, and some that we do. Those named included: the population decline in the Upper Peninsula; financial situation is under stress, within the church and in our communities; embracing strategic alliances to make better use of our gifts; general affirmation of mutual ministry across the diocese; effective leadership; aging congregations; and high visibility in the wider Episcopal Church as a result of the decisions of General Convention last summer. . . .
We envision a world in which all people live together in peace and in harmony with all of creation, where all can contribute and the gifts of all are joyfully received, nurtured, and supported, where our diversity is celebrated in community, and every human being is recognized as having eternal significance. We commit ourselves to identify, nurture and support the baptismal ministry of every single member/person of this diocese. The baptismal covenant is our guide and inspiration. These two statements guide the planning and living out of our goals and life together. Next the participants listed our strengths, which included: diversity of gifts and experience; strong collaborative leadership; embracing the gifts of everyone; high level of communication; sharing our gifts beyond our borders; and appreciation of the geographical region and its environment; among other items listed. These strengths will support the goals that were chosen for the near future. This Vision Statement appears centrally on the home Webpage of the Diocese of Northern Michigan. Long-time readers of the StandFirm site will recognize, in the words of the Vision Statement quoted above, the fine hand of the author of the Diocese's response to the Primates' Statement from Dar-es-Salaam in February 2007, which produced 124 comments all by itself. I want to make clear, however, that I am not judging or finding fault with the Vision Statement as a statement of values or principles; there is absolutely nothing wrong with setting a goal of living in peace and harmony with one's neighbors. The problem here is much larger than mere words, as we shall see. and to celebrate and serve the reign of God. Each Unit (such as, Encountering Our Story, or Gathered by the Spirit) is organized as Sessions spiraling about a major theme. The spine of the spiral is the Sessions themselves, which progressively consider the theme through the lenses of Experience, Creativity, Love, Liberty and Justice. This past summer the Curriculum Revision Group, after much discussion and reflection together, entered into a new partnership with the Dioceses of Wyoming and Nevada, along with Harvesters, a ministry development partnership of New England dioceses. The purpose of this partnership is a collaborative effort to thoroughly revise our curriculum. One of the first decisions we made, with Linda Grenz of LeaderResources working with us, was to describe our project as the creation of a “formation process” instead of a curriculum. The word formation is broader in scope than that of curriculum, and helps us to capture the vision we share of forming Christian communities of ministry – a formation process which is ongoing and inclusive of learning, prayer, spirituality, outreach, play, etc. We are calling this ongoing process of Christian ministry formation “LifeCycles”. We hope to share LifeCycles with the wider Anglican Communion. (Emphasis added.) Katharine Jefferts Schori, of course, had become the Bishop of Nevada in 2001. The article speaks of "this past summer" in May 2002, so it is clear that Father Forrester had been in contact with her after they both left Oregon. What I find most interesting, however, is that the partnership was between three of the most sparsely populated dioceses in the Church: Nevada, Wyoming, and Northern Michigan. There is more detail on the LifeCycles program here. Father Forrester transferred to the Diocese of Northern Michigan in 2001, at the invitation of its Bishop, the Rt. Rev. James A. Kelsey, who had assumed the post after the retirement of Thomas K. Ray in 1999. Bishop Kelsey was known for his advocacy of "Total Ministry", or "Mutual Ministry", a form of sharing the gifts of ministry among "the priesthood of all believers", and which traces its origin to the epistles of St. Paul. Now go back and read the summary of the course offered by CALL quoted at the beginning of this post. Can you begin to see a circle closing here? Weil is not only a scholar committed to the ministry of all baptized people, but also dedicated to inviting the laity to claim their own baptismal role and serve alongside the ordained, as ministers and celebrants of the liturgy. He has been very active ecumenically, and challenges us in a time of increasing multiculturalism to engage in new forms of culture, music, liturgical prayers and dance in our worship. has a long-standing, important connection with Northern Michigan as a liturgical consultant, for Jim Kelsey's consecration and the new commissioning liturgy, to mention just a couple, and taught Kevin and Rise Thew Forrester [the latter is Father Forrester's wife, and since 2002 the editor of The Church in Hiawathaland] and Anita Wingert as students at CDSP, and Rayford Ray [Bishop Ray's son] at Nashotah House. Louis was a significant contributor to the 1979 Book of Common Prayer, particularly the sections on Baptism, and continues to be a major leader in liturgical development on a national and international level. About six years ago, while living in Eastern Oregon, I realized the need to do some of my own soul-work. Perhaps having a child on the way had something to do with it. Perhaps turning 40 played a role. Perhaps having spent the last 20 years of my life struggling to change the church and recover baptismal ministry had left me a tad exhausted. The reasons are many, and they all led me to pay attention to my own heart and soul. Where was the Spirit? Where was life? Why did I tend to repeat the same mistakes in life and create the same hurts in those I loved? My soul-work entered a new stage on Pentecost, at Fortune Lake Lutheran Camp, when I, as a Christian, received Buddhist “lay ordination” and a new name, to go along with my Christian name: Genpo (Japanese, for “way of universal wisdom”). I now walk the path of Christianity and Zen Buddhism. What on earth would possess me to do something like this? Now my object here is not to criticize the man. All of us have been through crises of the sort that he describes, and many of us did no doubt much worse things than become lay Buddhists. What I am focusing on is the result for the Diocese of Northern Michigan. One could say that once given the truly unfortunate accident that took the life of Bishop Kelsey, the result we are seeing could not have been any other. For the goals of Mutual Ministry and Father Forrester's Zen Buddhism were first put to the test with the sudden vacancy created by that tragedy, and the result was a potent combination for a Diocese like Northern Michigan. It is a sparsely populated and widely scattered Diocese, which in 2007 was (and now still is) served by just five ministers who had seminary training, including Father Forrester and his wife, who is also an ordained priest. A significant proportion of its parishioners are 60 or over. They lose their vibrant and much-loved leader. What to do? Obviously a new bishop has to be chosen, so there has to be an election. The timeline began with conversations at Convention and around the diocese, continues with a Discernment Committee forming in February 2008, and the Election Convention to be held January 10, 2009. [The President, Linda Piper] noted that while decisions have not been made about the makeup of the Discernment Committee, it will be representative of the diocese, with membership from all four regions, as well as key leadership groups. Now please follow the ensuing process. The "Episcopal Ministry Discernment Team" (EMDT) did take shape in February 2008; its 21 members were announced in an article on page 2B of the April 2008 issue of The Church in Hiawathaland, drawn from the four regions of the Diocese, with additional members appointed both by the Standing Committee and by the "Core Team" (which included Father Forrester and other names we shall encounter, including the President of the Standing Committee). It was given a "Companion", Jo Gantzer, described here as "the Canon for Lifelong Learning of the Diocese of Michigan, [where] her responsibilities include formation for all ages and for Mutual Ministry. She is Co-Chair of Living Stones, the international organization for dioceses and communities seeking to further collaborative baptismal ministry." • help the EMDT to see where members are getting stuck. In addition to their "Companion", the EMDT also acquired three "Reflectors", persons off whom they could also bounce their ideas and candidates for ministry: these were Bishop Ely of Vermont, Bishop Caldwell of Wyoming, and Dr. Frederica Harris Thompsett, Mary Wolfe Professor of Historical Theology and former Academic Dean at Episcopal Divinity School. You may remember that Bishop Caldwell was one of the partners with Father Forrester in developing and trying out the LifeCycles program, as mentioned earlier. But he also works with Father Forrester as "an original member of the Ministry Developers Collaborative, an organization dedicated to working in support of persons working for baptismal ministry development." (More about the Ministry Developers Collaborative later.) And he has long-standing ties with the Diocese, having presided at the funeral service for Bishop Kelsey in June 2007. As for Bishop Ely of Vermont, the Diocesan newsletter of March 2008 informs us that "he is committed to collaborative ministry, nurturing a shared episcopate, ministry in small churches, encouraging cooperation among regional groupings of churches and the development of local ministry support teams in congregations." Sounds like a very compatible member of the team. Oh, and I forgot to mention: the Diocese of Vermont was also a partner with Father Forrester in developing the LifeCycles program. The third Reflector was Professor Thompsett of EDS, also well known to the Diocese. She was Chaplain for its convention in 2005, and was a speaker at its Baptismal Conference in January 2008, just before her appointment. Oh, yes, and EDS is "also a LifeCycles partner." Together with Bishop Caldwell and Father Forrester, Professor Thompsett works with the Ministry Developers Collaborative, and serves on its Steering Committee. You may see a list of those members on this page of the group's website, where you may read a lot more about their objectives and methods. Notice that another member of the Steering Committee is---Jo Gantzer! Is it all coming clear now? The discernment process is moving along on schedule. Our first few sessions were led by Marcia Franz, Kevin Thew Forrester, Fran Gardner and Hazel Satterly. Formation and team building were on the agenda for the first few meetings. Kevin led us through a brief oversight of the Enneagram showing us how our personality traits impact group process, how we receive and give information and how we make decisions. Later, using Steven Charleston’s reflection on Episcopal Ministry and spending time in discussion centered around the Congregational responses to questions 1, 2 and 3 the group has begun to get a clear direction of the expectations and hopes of the people in this diocese. This information will be refined and provided to each community for review. We have a vision of a shared episcopate modeled upon Mutual Ministry in which the Bishop’s primary focus is pastoral, relational and canonical in full partnership with an Episcopal Ministry Support Team. • We will continue to build on the organizational structures that are in place to support the life and ministry of the diocese. • We will identify an Episcopal Ministry Support Team that includes the Bishop. • We will make greater use of technology to facilitate communication. • We will strive to increase an understanding of Mutual Ministry throughout the diocese. • We will be realistic and responsible about our finances. • We will determine what an Episcopal Ministry Support Team may do. Today, Saturday June 7, we spent significant time with one of our EMDT "reflectors", Fredrica Thompsett, and our "Companion", Jo Gantzer. It was helpful to the group to hear their reflections, impressions, questions and suggestions. We continue to work on what our vision of the shared episcopate looks like. We continue to learn about and wrestle with the finances involved in our vision as it emerges. There are no names that have been raised, let alone considered, at this point. There will be a more detailed report in the form of a bulletin insert in late July or early August. Our next meeting is scheduled for June 21. The work of the Episcopal Ministry Discernment Team (EMDT) continues. Meeting-by-meeting we are reaching a greater clarity about our work and direction. As a result, we feel the time has come for another update to you, the people of the Diocese of Northern Michigan. From the beginning we’ve been modeling this process on the discovery (discernment) process used in most congregations throughout the diocese to form a covenant group. We now have twenty-plus years of experience in this process and think it has served us well. Making this adaptation has been our charge from the Standing Committee. We’ve discovered a great number of parallels but also some differences (for example, in a local discernment process there is no limit to the number discerned for a particular ministry role, but we are only calling one bishop). Since one of the key discernment principles used in our congregations requires that we know the people we discern “well to very well,” we’ve tried to use our creativity and imaginations to bring a similar knowledge to this process. We have decided to draw upon the knowledge and insights of some trusted “contacts” around the Episcopal/Anglican Church who have a grasp of what we are about. We will rely on their input for names rather than on a general invitation to “submit nominations.” We also realize that the required background checks must precede the announcement of any candidate, putting our projected calendar under stress. • We have embraced the concept of an Episcopal Ministry Support Team (EMST) which was widely supported by the congregational conversations. This will provide the setting for a broadly collaborative approach to supporting apostolic ministry in the diocese. • As we envision it, the support team will replace the Core Team and will be made-up of ten to twelve people, including the ministry developers (and bishop), the diocesan operations coordinator, regional representatives and at large members. There will be an attempt to balance the number of compensated and non-compensated members. We also see an ongoing evaluation of the team leading to a “second generation” in three to five years. • The Bishop will also serve as a ministry developer (missioner), a decision driven by financial realities as well as the emerging vision we’ve been exploring. • While the Bishop will carry out the roles designated by the Constitution and Canons such as ordination, confirmation, and attendance at the House of Bishops, other “episcopal/ apostolic/ oversight” roles will be fulfilled by members of the Episcopal Ministry Support Team (EMST). • We will present a single name for bishop to the Special Diocesan Convention based on the results of our discernment process. • We will present names for the Episcopal Ministry Support Team (EMST) to the Special Diocesan Convention based on the results of our discernment process. The leadership of the diocese in the absence of a bishop after Jim Kelsey’s tragic death formed (with Kevin Forrester’s leadership) an alternative to the traditional manner in which bishops are elected in this church. With lots of fancy language they explained how we would form a discernment team to look at the process rather than a selection committee - this team would have to meet in Marquette twice a month for almost a year and they asked each congregation to send representatives. This diocese is almost 400 miles from east to west and ASA is less than 700 - many if not most of the congregations have regular members of less than 2 dozen. The result being that members of the team were often self appointed because of the taxing amount of time necessary to drive as much as 200 miles one way twice a month to attend an all day meeting. So the “volunteers” gathered. Also understand that as a diocese run by mutual ministry - there are only a handful of seminary trained missioners (less than 5) present in the diocese so there is a gaping hole in the knowledge of liturgy, church history, canon law etc. So these volunteers are not familiar and easily swayed by a good presentation. Once the team was assembled - congregations were asked to hold meetings to discern “who we were” as a diocese - at my church this discussion essentially lead the people by the nose to come up with the “right responses” - very leading questions etc. and surprise surprise - the diocese said exactly what Kevin Forrester wanted them to say. Then the next big surprise leaked out last summer - there would be no election. The discernment team (not a true representative group where the politics are all on the table out in the open) would choose the bishop themselves and name the other members of the episcopal ministry support team - all that would occur at the special convention would be a thumbs up or thumbs down vote for the whole team. 6. Is it a “closed” process? In other words, have we seriously considered input from outside of this diocese? This has been an open process. We have asked for and received names from our contacts within the diocese, from outside of the diocese, and outside of the Continental United States. In addition to asking for recommendations from established contacts, we have also invited members of each congregation within the diocese to submit names of persons who they have discerned to meet the requirements, in accordance with the published guidelines. 8. How did you arrive at the figure for the compensation package? We truly want our ministry to reflect the equality and the vision of shared mutual ministry. Therefore, all of our Ministry Developers (including the Bishop/Ministry Developer) will be compensated equally rather then in a traditional hierarchical model. 12. How was it decided to present one name for Bishop/Ministry Developer? In the traditional search process anyone can throw his or her hat into the ring. Someone decides that they want to be a bishop. It is self-selection. We chose to use the discernment process that has served us well in the local congregations for the past twenty plus years. At the congregational level there is often more than one person discerned for the same ministry. The team after much discussion and struggle came to the conclusion that we would try to focus or stay true to what the congregational conversations had revealed. Because there is only one bishop/ministry developer we would try and discern one person that best fit the criteria outlined by the people of this diocese, the person who would most fully encompass these gifts. This person would be able to function as part of a team and truly be able to share the Episcopal leadership in this diocese. In a traditional election model three or four names are presented for the vote. Usually one person will stand out as a better fit and the others would be “ok.” People don’t know the candidates well when they come to convention. Our intention is to present one name based on prayerful consideration that is the very best fit for the ministry in this unique diocese. It is our hope that because of the careful, prayerful discernment of the team, one person will become the obvious choice. This one person will be presented to the diocese as the team’s best recommendation. It is our plan that the person who is discerned to be Bishop/Ministry developer will be revealed to the diocese as soon as the discernment process is completed. The people of this diocese will then have the opportunity to meet and/or get to know this person and the rest of the Episcopal Ministry Support Team prior to the Special Convention. It is the team’s hope that the people of this diocese will also discern and agree that this person is truly the best fit to share the ministry here in this diocese. At the election a yes vote would affirm the election of the new Bishop/ Ministry developer and ministry support team. A no vote would stop that process and we would have to go back to discerning once again. Because of this “yes/no” possibility the team goes forward with some apprehension trusting that God is working in and through us on behalf of the diocese. Doubtless most of the parishioners were already familiar with the candidate eventually named, the Rev. Kevin Thew Forrester. After all, he had been a part of the life of the Diocese for the past eight years, so he was not an unknown quantity. Nevertheless, as the local parishioners who commented at StandFirm and Titus 1:9 have stated, they felt left out of the process, and so could hardly be happy about being presented with just one choice. 5. Is the process we are using in accordance with the Canons? It is futile to point out that the word "election" comes from a Latin root meaning "to choose out", "to choose from among", and that there can be no election in the proper sense of the word when there is only one choice. Not only does the process violate the Diocesan Constitution and Canons, but it violates the very language of Canon III.11.1 just quoted. The national Canons also provide an alternative for going through the House of Bishops or through the Province, but neither of those fit the model here, and so they were not used. The delegates to the "Special Convention" were specially chosen, and presented with a fait accompli to ratify, or else to face accusations for blowing up the process. The outcome was, under the circumstances, foreordained. Truly, it was an election designed by a Zen Buddhist. The choice was to vote for one: you may (a) choose the Rev. Kevin Thew Forrester and the team of Ministry Developers, or (b) choose the team of Ministry Developers, including the Rev. Kevin Thew Forrester. Such a choice is the electoral equivalent of the sound of one hand clapping. In other answers to questions, the EMDT disclosed that it felt the second convention of the Diocese of South Carolina, held after the initial consents to the election of Bishop Mark Lawrence were not obtained, was a precedent for what it was doing. At that second convention, Mark Lawrence was the only name submitted for election. Needless to say, however, that was a second, not a first, election to fill the vacant post of bishop. It is again typical of the entire process that it would isolate that event and call it a precedent for the procedure it claims to be following. Many of the other blogs have gone into the theological incompatibilities between Buddhism and Christianity; I shall not rehash those debates here. For me, it is sufficient to note from all the facts I have set out above that the driving force behind this latest "election" is neither Buddhism nor Christianity as such, but the spirit of the 1970s that gave us a new Prayer Book, a new Baptismal Covenant (thanks, Professor Weil---I do not know your contributions to the new ordinal vows, but you might also want to read this post), and a whole new set of liturgies. The leaders of this movement have ever since sought validation for what they did, and they seek it by trying to envelop both the laity and the clergy in its friendly atmosphere of inclusiveness, designed not to scare anyone away with hocus-pocus, mumbo-jumbo or negative statements. Again, there is nothing wrong with friendliness or inclusiveness as goals, but they have to take second place to the content of the faith itself. When that content is subordinated to the ministry, so that the ministry can envelop everyone regardless of the level of their faith or understanding, and regardless of whether they hold contradictory views such as Buddhism, or Islam, or Wiccan or even Druid sentiments, the content gets lost in the All---or is it the shunyata? Anyone who has troubled to read this far should appreciate the magnitude of the uphill battle that lies ahead. It should be obvious from all the connections spelled out earlier that a number of bishops, beginning with the Presiding Bishop, will want to see this election confirmed---not for the benefit, necessarily, of the parishioners in Northern Michigan, but for its precedential value as a method to control the selection of bishops in other dioceses. Take a look around the Church. The movement for "Mutual Ministry" is already flourishing in many other dioceses (albeit the more sparsely populated ones)---Eastern Tennessee, for example, parts of New England, and even the Church of England. As finances become critical with declining membership, the model of the "Bishop/Ministry Developer" pioneered in Northern Michigan will become attractive to more dioceses. Because Mutual Ministry is virtually content-free (it has to be in order to be all-inclusive), it combines well with any other set of spiritual beliefs, not the least of which is Buddhism. This is where the changes of 1979 have brought us. The future of our Church lies before us as we watch what is happening in the Diocese of Northern Michigan. In what can be described only as a somewhat terse performance by its collective justices, the California Supreme Court has corrected a rather glaring error in its prior opinion in The Episcopal Church Cases, 45 Cal.4th 467 (2009). It has published a short per curiam (meaning: unsigned) order, which it says does not affect its earlier judgment. But since the order has no byline, and carries no explanation, its significance is easy to miss. Those to my left have, as usual, jumped to totally unwarranted conclusions. Out of the three sentences used by the Court to describe what it was doing, they select only this one: "The [local churches'] petition for rehearing is denied." Then they trumpet headlines like "California breakaway churches lose in court again". What they ignore are these words: "Request for modification granted. . . The opinion is modified." (Emphasis added.) If I were to read things as one-sidedly as they do, I could have titled this post: "California orthodox churches win in Supreme Court"; or (only slightly less outrageous) "Supreme Court concedes mistake in prior ruling in favor of ECUSA". I have decided instead to reach two birds with just one cast, and call what has happened in both the Supreme Court and on liberal blogs "rushing to judgment". I explained in this earlier post what was wrong about the Court's original opinion. Briefly, the Court said it was deciding "the merits" of the case---before the defendants in the case, the individual parishes in Orange County who had each been sued first by the Diocese of Los Angeles and then by the Episcopal Church (USA), had even answered the complaints! Just like any other branch of government, courts cannot deprive people of their property without following "due process of law". One does not have to be an attorney to appreciate that if you are sued, you get a chance to answer your opponent's complaint before anything can be decided in your case "on the merits". The error must have been at least a little embarrassing for the justices and their law clerks. In their zeal to render an opinion in the case, they literally rushed to judgment by purporting to decide the case "on the merits". The latter is a legal turn of phrase meaning that the case is decided squarely on the facts presented to the court, instead of being brushed aside on procedural or technical grounds that do not resolve any of the factual or legal issues raised. Normally, therefore, one expects a decision "on the merits" at the end, and not at the beginning, of a case. For the Court to assume it could decide the merits of the Episcopal Church Cases before the churches themselves had even an opportunity to answer would make it look as though the justices were biased, or had prejudged the case to such a degree that they did not even need to hear from any of the defendants. In other words, they would be saying: "Our minds are made up---don't confuse us with the facts!" Now let us take a look at how the Court has gone about stepping back from its mistake. The modifications it made may best be understood by presenting the text of the original opinion below. Then, by using strikeouts for deletions and underlining for new language, I show just what the Court decided to change in order to avoid any appearance that it was prejudging the case. Applying the neutral principles of law approach, we conclude, on this record, that the general church, not the local church, owns the property in question. We granted review to decide whether this action is subject to the special motion to strike under Code of Civil Procedure section 425.16 and to address the merits of the church property dispute. Are you beginning to see what the Court is doing here? By inserting a second infinitive ("to address"), the Court has changed the meaning of its original sentence from "We granted review to decide . . . the merits of the church property dispute" to "We granted review . . . to address the merits of the church property dispute." Both lower courts also decided addressed the merits of the dispute over ownership of the local church---the trial court found in favor of the local church and the Court of Appeal found clear and convincing evidence in favor of the general church. We will also decide address this question, which the parties as well as various amici curiae have fully briefed. We will first consider what method the secular courts of this state should use to resolve disputes over church property. * We will then apply that method to resolve analyze the dispute of this case. For these reasons, we agree with the Court of Appeal's conclusion (although not with all of its reasoning) that, on this record, when defendants disaffiliated from the Episcopal Church, the local church property reverted to the general church. Now, then, just what do these changes accomplish? First, note that the Court has definitively backed off from its pretense to have decided the merits of the case; instead, it has only "addressed" them---or, in the other instance, it has "analyzed" the merits instead of "resolving" them. This is a huge relief to all concerned. (I doubt that even ECUSA's attorneys would have wanted to defend the position that it was entitled to a final judgment just by filing its complaint, without ever having to prove its case.) Second, the Court's "addressing" of the merits applies only to the merits as shown "on this record"---i.e., on the case in the posture presented to it, before the defendants have had a chance to answer the complaints. Thus in reversing the dismissal of ECUSA's complaint, the judgment of the Supreme Court has the effect of reinstating the complaint, and requiring defendants to answer it (they cannot demur to it any more). The Court has held, in effect, that if everything the Church alleges were true, then it would be entitled to the property of St. James's, Newport Beach. Things are now, in short, back to normal. A demurrer to ECUSA's complaint was sustained by the trial court, reversed by the appellate court, and the reversal was affirmed by the Supreme Court. The case will now go forward on ECUSA's complaint (and on the Diocese's, as well). If ECUSA proves at trial that everything it alleged is true, then it can use what the Supreme Court said on the merits "on this record" to ask for judgment in its favor. But if the facts turn out to be otherwise at trial than what ECUSA alleges, it could prove to be a whole new ball game. It is way too early to tell. Certainly it is premature to crow about "losing again in court". Read the caption below this picture first. When you are done, scroll down to the second picture. 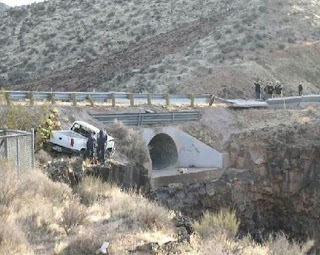 This is the scene of an accident that occurred outside of Hurricane, Nevada (135 miles northeast of Las Vegas) on State Route 59. The white pickup you see at the left had been traveling about 80 mph from right to left in the picture when it crashed through the concrete guardrail, where you see the people standing and pointing. It hit the metal part of the culvert outlet, flipped around end-to-end, and landed where you see it---facing in the opposite direction from that in which it had been traveling. The 22-year-old driver and his 18-year-old passenger were unhurt, apart from minor cuts and bruises. Have you got that fixed in your mind? Now look at the second picture, below . . .
Mark U. Edwards, Jr. is a brave man. He was diagnosed in 1996 with myeloma (mutation of the plasma cells most often found in bone marrow), an incurable form of cancer, and given three years to live. He is still going strong. A former president of St. Olaf College, he is currently senior adviser to the Dean at Harvard Divinity School. He is author of Religion on Our Campuses: A Professor's Guide to Communities, Conflicts, and Promising Conversations (Palgrave Macmillan, 2006). Over the last year, while continuing to undergo various treatments for his myeloma, he has worked on a project called "Having a Stake, Making a Contribution: Religious Perspectives in American Higher Education," under a grant from the Lilly Foundation. Knowing that one has an incurable fatal malignancy with a three-year median survival rate focuses the attention. Why me? How long do I have? What do I think about death and dying, not in the abstract, but as a perhaps rapidly approaching personal likelihood? How does it change how I understand what I have done up to now? How might it direct what I attempt to do in whatever time I have remaining? I mention these personal questions because they point to the existential nature of cancer. When I turn to cancer "from the inside out," I am able to shift to speaking of my illness rather than my disease.1 This shift to the subjective and existential raises the question of how we can reasonably discuss illness as well as disease at an academic level. After all, academics are also human beings who will, someday, become fatally ill.
1 This point is an important one, and I owe the distinction to the medical sociologist and writer Arthur W. Frank. See his At the Will of the Body: Reflections on Illness (Houghton Mifflin, 1991). The distinction between "illness" and "disease" is one between seeing cancer, for example, "from the inside out"---as something that is a part of you---and seeing it objectively, as a diagnostician or medical researcher might view it, "from the outside in". Mark Edwards' article is all about the clashes that these two differing viewpoints entail---particularly for those who hold religious views. Religious explanations are sometimes stigmatized as unscientific because they entail evaluative and purposive arguments. So religious traditions have an interest in encouraging a nuanced and sophisticated understanding of how scientific and medical models actually are constructed and evaluated. Specifically, religious traditions benefit when students and laypeople generally recognize that scientific models also have purposive and evaluative elements either built into the models themselves or underlying their creation or both. To be sure, the presence of purposive and evaluative elements should not be used to disparage the awesome accomplishments of scientific method.3 On the contrary, scientific modeling remains one of the most powerful and convincing approaches to knowing and understanding, explaining and interpreting, employed by human beings. But scientific modeling is a human activity, and reflects human values and purposes. That which is modeled—nature in the raw, as it were—may lack purpose or value or even meaning, but our scientific models do not. At the very least, then, the presence of purpose and value in scientific as well as in religious accounts should not, ipso facto, be used to disparage either one. 3On the science side of this debate, see James Robert Brown, Who Rules in Science: An Opinionated Guide to the Wars (Harvard University Press, 2001). For an analogous argument from the side of liberal Christianity, see James M. Gustafson, An Examined Faith: The Grace of Self-Doubt (Fortress Press, 2004). Cancer can be understood as a byproduct of the evolution of complex animals (which include human beings). Cancer is one of the negative consequences, first, of complex animals' need to regenerate their tissues, and, second, of the evolutionarily beneficial ability they have to reshuffle their genes. Complex animals need to constantly regenerate tissue. To accomplish this necessary regeneration, animals have various stem cells that can, through various steps, produce the specialized cells that need to be replaced. Animals also have the pathways—for example, the lymphatic and vascular channels—that allow the stem cells or their offspring to get to where they are needed. Cancer is a stem cell or one of its products running amok and spreading beyond its place of origin. Without the ability to recombine genes, there would be no complex animals, no human beings. We would not have evolved if genes were fixed and could not mutate. To be sure, our cells are remarkably good at copying our DNA accurately and at repairing or eliminating copy errors. But occasionally an error gets through. Over many millennia these occasional mutations, filtered through the sieve of natural selection, have led to the variety of forms of life we find around us. But occasionally an error gets through—or, more likely, a succession of errors accumulating in a clone cell, its sub-clone, it's sub-clone's sub-clone, and so on—and is filtered through the sieve of natural selection within the microenvironment of the body and produces a malignant cancer. Cancer is understood as a natural process. It is part of our evolutionary legacy and operates through successive mutations and selection within the microenvironment of the body. As a natural process, cancer develops by chance, follows no plan, and cannot be characterized as good or bad, right or wrong, purposive in the teleological sense, or unnatural. For many academics, questions of good or bad, right or wrong, teleology or purpose are observer relative. [Footnote omitted.] That is, they are human constructs and are projected by human beings onto natural entities or processes. By these lights, cancer cannot be understood as good or bad as a natural process; it is good or bad only in relation to our interests and interpretations. Some religious traditions challenge this initial naturalistic assumption. They insist that such properties as goodness or purpose are intrinsic to things in a created cosmos. Or alternatively, that such properties may be considered observer relative if one admits that God is the observer whose constructs and projections are actions that bring about what they say. We may debate whether nature can be described as purposive or whether questions of right or wrong, good or bad, or issues of teleology are appropriate or meaningful when applied to nature. But the study of nature is purposive. What is more, the study of nature reflects often strongly held value judgments (if only the strongly held value that values ideally have no place in scientific research!). It is therefore important to distinguish between cancer as part of nature and cancer as a field studied by human beings. Nature may be neutral; science certainly is not. Nature may have no purpose; but scientists inescapably do. Scientists may be objective in that their results can be granted a high degree of reliability and "fit" with nature, but in their choice of what to study, why to study it, and for what ends, scientists are not value-neutral, nor are the sources from which scientists receive their funding. Religious ways of knowing may differ in significant ways from academic ways of knowing, but the similarities are greater than some admit. And when it comes to issues of purpose and value, the difference is expressed at most in degree, not in kind. Faculty, students, and laypeople who are cognizant of such nuances are better able to evaluate both scientific and religious arguments, and better able to gain from each worthwhile insight for their studies and for their lives. 8 Stephen Jay Gould, "The Median Isn't the Message," Discover, June 1985. 9 Stephen Jay Gould, Full House: The Spread of Excellence From Plato to Darwin (Harmony Books, 1996), 49. Gould survived mesothelioma, labeled an "inevitably fatal form of cancer," only to succumb to a different cancer 20 years later. The conflict between the general and the specific, the rational and the personal, is at its sharpest when deciding on measures by which to treat a particular person's cancer. The effort, still being pursued in academic quarters, to reduce human intelligence to certain discursive rules that can be embodied in a computer program clashes with the intuitive approach of clinicians who trust their own, fallible diagnoses only so far, and who act (again, fallibly) on their sense of "what treatment regimen is best for a particular patient, not patients in general." Decisions about treatment have an ameliorative purpose: their reasoning presupposes that treatment should make the patient's "condition" better than it would be without treatment. . . . So, from the outset, the academic who is also a clinician is guided by purpose and immersed in value judgments, starting with, "Will this treatment help this particular patient or at least do no harm?" But what constitutes help? And how does one trade off between help and harm? For example, most chemotherapy has harmful side effects. How does one weigh the possible benefit from chemotherapy against the certain harm that it will cause? Practical reasoning deals with just such questions. The patient is also immersed in purposive and value judgments. . . . So how do I trade length of life for quality of life? What are my goals in the choice of treatment, and how do my values guide me? The reasoning and trade-offs can become yet more complicated. What if the clinician and I disagree on what treatment is "best," given my particular case, his clinical judgment, and my thoughts about quality and quantity of life? One plausible answer is that one person's interests—in this case, probably the patient's—should be seen as morally overriding. After all, isn't it my life, my health, my sense of trade-off between quantity and quality of life that is at issue here? Naturally, a patient can say "no" to a treatment, and except for cases where the patient's judgment is thought to be crucially impaired and guardians or the courts step in to represent the patient's interests, that "no" is final. But refusing treatment differs significantly from demanding that a certain treatment be accorded. The patient often cannot and sometimes should not be the one who decides. The patient's wishes cannot, for example, trump a clinician's judgment when the patient wants a treatment that the clinician thinks is inappropriate, dangerous, or even morally questionable (i.e., entails unacceptable risk to the patient or to others). Further, just because a patient wants a particular treatment does not mean that her insurance company will pay for it, even if the patient's clinician also favors the particular treatment. There may also be limits on other resources: for example, everyone who wants a transplant does not get one, because there is a limit to available organs. And so it goes. Disease talk invites the patient to think of the body as a "site" "out there." In disease talk the patient adopts the perspective of the physician or scientist. Disease talk lives and breathes academic objectivity. Illness is the experience of living through the disease from "inside out." It attempts to capture the lived experience of one who has the disease. It lives and breathes existential subjectivity. Disease talk is appropriate in many contexts and can be helpful to the patient, but it has limitations. I may accept rationally that multiple myeloma is an unfortunate but natural by-product of evolutionary processes. I may find it comforting (at least at one level) that my disease developed by chance, without plan or purpose. I may wrestle with all the practical wisdom I can command with decisions about diagnosis and treatment. But in wrestling not with my disease but rather my illness, I personally may need more than what the academy currently offers in all its sciences, natural and social. How, for example, do I understand and explain to myself my existence as a singular, situated, thinking being who is living with an incurable, fatal disease? How do I understand my mortality and vulnerability? How do I understand the fear that this raises? How do I live with as much good humor as I can muster with the pain, the disorientation, the fears, and the other unhappy by-products of a nasty disease and the associated nasty ways of treating it? How do I deal with uncertainty, despair, and hope? How do I work all this into the story of my life? Where does it feature in my understanding of my destiny? How do I deal with all this from the inside of lived experience, rather than from the outside of detached analysis or prescription? And how do the various approaches to reasoning and judging in higher education help or hinder me in tackling such questions? These are questions that are deeply and ineluctably raised by every human being fortunate to live long enough to gain a certain experience and maturity and who, then, has to deal with a life-threatening disease. Traditionally, they are questions addressed by religion (and by great literature and art). I do not claim that religious traditions always address such questions well. Quite the contrary. . . . Illness is interpreted as, basically, a psychological event, and people are encouraged to believe that they get sick because they (unconsciously) want to, and that they can cure themselves by the mobilization of will; that they can choose not to die of the disease. These two hypotheses are complementary. As the first seems to relieve guilt, the second reinstates it. Psychological theories of illness are a powerful means of placing the blame on the ill. Patients who are instructed that they have, unwittingly, caused their disease are also being made to feel that they have deserved it. It is worth pondering whether calls for "a positive attitude" and a "determination to lick this thing" become an anemic psychological substitute both for a more profound understanding of the evolutionary and biological nature of cancer and for a religious or philosophical view that more deeply addresses, even if it may not satisfactorily answer, the painful questions that fatal illness poses. The persistence and vigor of a psychological human response to disease (or even of a "sublimated spiritualism," to employ Sontag's term) underlines how the "rational" and "reasonable" ways of knowing that higher education offers may leave important questions not only unanswered but unaddressed. We may outgrow or reject the religious answers of our youth. We may find implausible or even revolting the answers given by the religious traditions found in our society or elsewhere in the world, for reasons including those we just treated in the last few paragraphs. As experiencing human beings, we can ignore or bracket these questions for a time, but we can never really escape them. They arise out of life itself. They are questions of deep meaning, value, and purpose. Here, it would seem, a better understanding of science might help reasoning about illness from the inside out. This "better understanding", however, eludes those who remain within the narrow world of hypothesis, experiment and observation. Unfortunately, many health providers act and speak in ways that make it difficult for cancer patients to recognize "the body coming back to itself." The objectifying, distancing stance that turns the body into a "site" where there is "cancer" that "must be treated" can quickly lose sight of the person who is that "site" and is experiencing all that it means to be "treated"— including the worries, the fears, and the sense of loss and change that accompanies a person's illness. At its worst in this regard, modern medicine can descend into a war to the death between doctors wielding the miraculous tools of modern science against the exquisitely evolved defenses of cells run amok. The battlefield becomes the patient, whose illness and all its experienced meaning is overlooked, ignored, or denied. In what ways are we in the academy able to reason about such conflicting views and experiences without limiting our answers to a narrow range of what constitutes reasoning and rationality, objectivity and distance? Can insights from case-based practical reasoning help in this regard as well? What about insights gleaned from our religious traditions? It goes without saying that religious and philosophical traditions are not the only communities to care about the distinction between disease and illness. Psychologists, nurses, doctors, experts in hospice care, and others have wrestled with how to understand and help the patient deal with not only her disease but also her illness. The issues are not easy, and proposed resolutions are frequently unstable and shifting. Now Edwards delves into what he himself is best able to contribute: a unique perspective, "from the inside out", on what it feels like for a person who is both academic and religious to be a cancer patient. it cost me energy, which was scarce. It also cost me opportunities to express what was happening in my life with cancer and to understand that life. Finally, my attempts at a positive image diminished my relationships with others by preventing them from sharing my experience. I conclude from my own experience with severe illness that there is much truth in Frank's description of the deal-making that we ill folks go through to satisfy the expectations of others and to secure as much care and support from providers as possible. But in his zeal to recover what is commonly overlooked—namely, the ill person's self-denying and enervating accommodations to the expectations of family, friends, and the medical system—Frank may have minimized analogous costs borne by family and caregivers when ill persons insist on their right to fully express fears, angers, loss, and incoherence. The patient's unbridled self-expression may be healthy—a reaching out to ask others to understand what the patient is experiencing—but it imposes a cost on family and friends, who are also dealing with fear, anger, loss, and incoherence because of their loved one's illness. It also puts additional demands on frequently overworked caregivers, who have multiple needy patients to deal with. So who does rightly get to demand what of whom? How's the balance struck? How does one reason and make judgments regarding such conflicting claims on the emotions, expectations, needs, and behavior of others? How does one balance the gains here against the losses there? Again, there are no certain answers to such questions, only reasonable, shifting approximations. Is it unreasonable to struggle with questions for which we know at the outset we'll secure no agreed-upon answers—or, at least, no answers that will find agreement much beyond the confines of one's community of practice? This is not just a question to be posed to religious communities. Disciplinary communities are as capable, I would submit, of asking pertinent questions for which they find no consensus on reasonable, much less "rational" answers. There is a value in asking questions for which there are no answers; the questions themselves may be the vehicle to a broader understanding of reality in general, and of illness in particular. More far out: Is it possible (and if so, is it appropriate) that modern scholarship limits the questions it asks in exchange for a greater likelihood of depth or precision or "certainty" secured by those limits? That may be a worthwhile trade-off, but one must then ask whether by asking questions of a certain answerable sort, modern scholarship may be shortchanging the range of true human reasonableness. What is being lost in questions bypassed because they fall short of imposed standards of rationality or even reasonableness, certainty or even reasonable certitude? I cannot help but wonder whether self-imposed limitations may put some of us in the position of the man looking for his car keys under the lamppost because it offers the most illumination. Modern scholarship may have achieved great power and purchase by limiting what it takes to be knowledge and reason. But this can verge into dogma: there are no keys unless under the lamppost. Or the keys not found under the lamppost are not true keys. Or they are keys by courtesy designation, only. Are we shortchanging ourselves? Edwards, who has obviously gone down this road himself, concludes with a call for academicians to open themselves to the possibilities of other ways of "knowing", as valued most prominently in faith-based communities. There is an aspect to knowing and judging in complex, contingent, and situated cases that cannot be captured in discursive rules. At least with expert practitioners, knowing and judging rely to varying degrees on trained imagination and experienced intuition. Such knowing and judging rely on tacit understanding, to employ the philosopher Michael Polanyi's term. A significant component of religious understanding and commitment also arises out of the human ability to intuit integrated wholes from specific, contingent details. This ability is at play when religious inquirers interpret narrative texts; when they reason through specific cases of conscience and reach probable (but rarely certain) judgments regarding the appropriate thing to do; and when they address questions of meaning, value, and purpose from the inside out. So, religious traditions have a stake in acknowledging and defending tacit understanding. So, too, do even the "hardest" scientific disciplines, which, in practice, also have depended on intuition and nondiscursive insight to surface some of their most fruitful discoveries. Finally, to claim that religious traditions have a stake in narrative, case-based, subjective or existential, and tacit ways of knowing does not mean that the use to which religious traditions put these various ways of knowing necessarily leads to true understanding or right judgment. To apply legitimate methods to appropriate problems is crucial to sound reasoning, but it does not guarantee truth. However, once these methods are recognized as legitimate when applied to appropriate issues or problems, their use by religious traditions can no longer be employed as ipso facto grounds to disqualify religious claims as meaningful knowledge in general. That awareness may allow academics to see their own disciplines better and make them more willing to entertain different, and perhaps even religiously inflected, ways of knowing. All in all, this was a very worthwhile read. I commend it to those who are having to deal with the realities of cancer "from the inside", whether as patient, or as caregiver. It is a gentle call to recognize that while we face ourselves when we face our illnesses, we are not alone. For as God makes us in His image, we are all ultimately in His hands.